If you or a loved one has been injured by a medical professional, you need an experienced medical malpractice attorney fighting for you. Being the victim of medical malpractice is devastating. Victims often sustain agonizing, potentially life-threatening and life-altering physical and emotional injuries, face the prospect of financial ruin, and experience a catastrophic disruption to their entire way of life. Chris Larmoyeux and his team of medical malpractice legal professionals understand what you’re going through. You have questions about your rights, how much your claim may be worth, and how long it’ll take to get a fair recovery. Let’s get started. Why Hire a Dedicated Medical Malpractice Lawyer? Chris has devoted his nearly 40 years of legal practice to helping victims of medical malpractice in and around West Palm Beach, Florida. He is one of Florida’s top medical malpractice attorney’s. He is among the 1% of all lawyers who are Board Certified in Civil Trial Law by The Florida Bar, has been awarded the highest possible rating for Legal Ability and General Ethical Standards by Martindale-Hubbell—the preeminent independent lawyer rating service, and consistently earns annual inclusion in the entirely peer-review lawyer rating service Best Lawyers. And, yes, he’s won numerous $1 million+ recoveries for victims of medical malpractice and their families. Chris personally handles every case he agrees to take and treats every client with compassion and understanding. When you hire Chris, you get Chris. He is personally involved through the entire claims process; he doesn’t hand victims off to junior associates or recent law school grads once victims have entrusted their claim and hopes for the future to him. He understands the enormous trust clients place in him and would never do anything to violate or undermine the sanctity of that trust. Contact Chris by starting a live chat, calling now (561) 805-1214, or request a callback. Read on to learn why you need his qualifications and experience if you or a loved one has been injured at the hands of a medical professional. Time is not on your side. Each day you delay in seeking legal help is one day closer to you being time-barred from ever bringing a claim for your injuries. According to the National Center for Health Statistics, a sharp increase has occurred in the number of filled emergency room beds throughout the United States. Sadly, as this number continues to rise, the number of emergency departments has fallen. The combination of these two changes has led to emergency room crowding and thus a vast increase in emergency room errors. While emergency rooms are typically chaotic in any case, a lack of resources places all patients in a compromising situation. When a high-pressure environment is combined with an abundance of patients, the likelihood of emergency room errors grows. As medical professionals rush around in an attempt to treat as many patients as quickly as possible, cutting corners often leads to patients paying a price. Regardless of these factors, the staff members of the emergency room have a duty to offer the best care, accurate diagnosis, and proper treatment for each and every patient. When an emergency room error occurs, the results can be life-threatening. West Palm Beach hospitals, much like the rest of the United States, are experiencing rises in emergency room patients. If you or a loved one has suffered due to an emergency room error, you may be entitled to compensation for your losses. For fast help and free case evaluation, contact our West Palm Beach medical malpractice law firm today. Medication errors can come in a variety of forms. While physicians and hospital personnel have your best interest in mind, adverse reactions to medication, unexpected reactions to medication, pharmaceutical issues, medical device failure, and overdose do occur. Medication errors comprise a wide breadth of complications. Chris accepts and has experience handling all types of medical malpractice cases. During his nearly 40 years in practice, he’s helped victims and their families with just about every kind of medical malpractice claim, including, but not limited to, those involving doctors, nurses, medical staff, and pharmacists as well as doctor offices, healthcare clinics, hospitals, nursing homes, and pharmacies. If you’ve suffered a medical-related injury at the hands of anyone associated with the healthcare system, contact Chris today for a free, no-obligation case evaluation. Don’t delay. Time is not on your side. There is a narrow timeframe in which you must file a claim or lose your right to do so forever. Contact Chris by starting a live chat, calling now (561) 805-1214, or request a callback. The laws governing medical malpractice cases in Florida are so complex and specialized that victims simply must have the assistance of an experienced medical malpractice lawyer in order to obtain full and fair compensation. There are very strict and complicated filing deadlines and requirements that must be followed, or your case will not even be allowed to proceed, regardless of the actual merits of your claim. Similarly, there are numerous other legal technicalities and complexities in place that make successfully prosecuting a medical malpractice claim virtually impossible for anyone other than a dedicated medical malpractice lawyer. Medical and insurance interests have successfully lobbied state lawmakers aggressively over the years to get legislation enacted that makes it difficult to hold healthcare providers accountable for their errors. The system really is tilted heavily in favor of the healthcare industry to the detriment of victims and their families. Fortunately, Chris has the experience and knowledge to successfully navigate the complexities of Florida’s medical malpractice laws in order to obtain full and fair compensation for you and your family. Would you go to your primary care doctor for heart surgery? Of course not because you’d want a doctor who devotes his or her practice to performing heart surgery. The experience and knowledge acquired over many years of focusing on heart surgery are absolutely essential for increasing the likelihood of a positive outcome. That’s common sense. The same holds true when you’ve been the victim of medical malpractice. For your best chance at a positive outcome to your case, you need a dedicated medical malpractice lawyer, not someone who handles the occasional medical malpractice case. The laws and procedures governing medical malpractice claims in Florida are undoubtedly among the most complex of any type of law. In fact, even knowledge and experience with general personal injury law simply aren’t enough to win a recovery in a medical malpractice case. There are important laws, rules, and procedures specific to only medical malpractice claims. Chris has been dedicating his legal practice to Florida medical malpractice cases for nearly 40 years. Contact him today, and he’ll put his decades of experience and knowledge to work for you and your family. So Many Lawyers: How to Choose One? There are so many lawyers. It’s true—in fact, there are far too many … but it’s equally true that there aren’t enough really good ones. So how do you identify and choose one of the really good ones? The one with the flashiest website, catchy jingle, ubiquitous advertisements? Basing your decision on those factors is simply choosing the lawyer with a good marketing team, who may or may not be one of the really good lawyers. It’s still just the luck of the draw. But this situation shouldn’t be that surprising. It’s the same for any profession or job. Think about your own. You know from experience and reputation that the quality of your peers ranges from exceptional to incompetent. The same is true for medical malpractice lawyers. Some are highly skillful, conscientious, and professional while others are relatively inept and disinterested at best. As an insider in your own local sphere of expertise, you know who you’d want and wouldn’t want to help your family and friends. Unfortunately, in many industries, it’s nearly impossible for outsiders to identify the best, average, and worst members before making a hiring decision. This is especially true when hiring a medical malpractice lawyer, and it’s a huge problem for victims of medical malpractice and their families. The good news is there’s hope! With the right information and guidance, finding a top medical malpractice lawyer isn’t a matter of luck or chance. If you know what to look for, it’s actually easy to find the best medical malpractice lawyers in Florida. Who knows the best lawyers in your area? Other lawyers. It really is that simple. The best lawyers are generally the ones other lawyers would want as their lawyer if the need arose. These are the so-called “lawyer’s lawyer,” the ones held in the absolute highest regard by their peers. Although it’s true there are lots of lawyers, it’s actually a relatively small community within each practice area. Most lawyers either personally know or know of fellow lawyers within the same practice area, and that’s true of medical malpractice lawyers. Therefore, lawyer certification, rating, and other similar services that rely primarily on rigorous and systematic peer evaluation have the highest success rate in identifying the best lawyers. In reality, there are only a very limited number of these types of services. The hardest part for members of the general public is identifying them. Most of them have been around for decades and are well known only by those in the legal community. Board Certification by The Florida Bar, AV Preeminent rating by Martindale-Hubbell, and inclusion in Best Lawyers rating service can only be achieved by earning the highest ratings and reviews by a lawyer’s peers. Chris proudly holds all three distinctions. Contact him by starting a live chat, calling now (561) 805-1214, or request a callback. According to The Florida Bar, Board Certification “helps consumers identify specialists in various areas of the law.” There are 27 areas of law in which attorneys can earn Board Certification, including Civil Trial Law. Earning Board Certification is a tremendously rigorous process involving evaluation of candidates’ subject matter expertise, thorough peer reviews, character and ethics investigations, and proof of significant involvement within the legal community. Medical malpractice itself is not one of the 27 Board Certified specialties. However, it’s important to understand that Civil Trial Law is absolutely critical to successfully practicing medical malpractice law at the highest level. 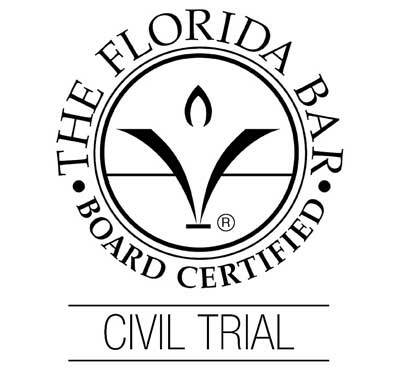 The Florida Bar describes Civil Trial Law as “the practice of law dealing with litigation of civil controversies in all areas of law before state courts, federal courts, administrative agencies and arbitrators.” In a nutshell, Civil Trial Law is the rules of engagement for parties to a legal dispute based on civil procedure. Many of the rules of civil procedure are so esoteric and intricate that even many longtime practitioners do not fully appreciate all their nuances. When non-lawyers derisively refer to ‘legal technicalities,’ very often they are talking about some aspect of the rules of civil procedure. Cases can literally be won or client’s case helped by a lawyer’s superior knowledge of Civil Trial Law to outmaneuver opposing counsel, having little or nothing to do with the actual substantive merits of the parties’ claims or defenses. The opposite also holds true; cases can similarly be lost or weakened by a lawyer’s lack of expertise in Civil Trial Law. If you are faced with financial ruin and a lifetime of medical treatments due to the actions of your medical provider, who do you want battling the insurance companies and their army of lawyers on behalf of you and your family? Chris is among the 1% of all Florida lawyers Board Certified in Civil Trial Law and has been successfully taking on the insurance companies for nearly 40 years. Contact him by starting a live chat, calling now (561) 805-1214, or request a callback. Using football as an analogy, a coach who has a brilliant offensive and defensive mind (substantive knowledge) will still not be successful if he doesn’t also have a firm understanding of the rules of the game such as when the play clock starts, when the game clock stops, illegal formations, what constitutes a penalty, etc. Think of Civil Trial Law as the “rules of the game” that govern medical malpractice cases, and a lawyer who dedicates himself or herself to medical malpractice as having a brilliant mind for that type of the law (substantive knowledge). But that alone won’t necessarily make that lawyer among the top medical malpractice lawyers. Ideally, you want a lawyer who is also an expert in the “rules of the game” as evidenced by being Board Certified in Civil Trial Law by The Florida Bar, which strictly prohibits any lawyer who is not Board Certified to claim he or she is an “expert” or “specialist” in Civil Trial Law. Chris is an expert and a specialist in Civil Trial Law. The Florida Bar authorizes him to say that because he’s among the 1% of all licensed attorneys in Florida who is Board Certified in Civil Trial Law. Just as Board Certification serves as the gold standard when it comes to legal certifications, Martindale-Hubbell Peer Review Ratings similarly is the most prestigious and widely recognized lawyer directory and rating system within the legal community. When legal decision makers were asked in a recent study if they could appear in just one legal directory (lawyer rating service) which would they select, 71% chose Martindale-Hubbell. Most of the other lawyer directories and rating services received less than 2% of the responses. Martindale-Hubbell ratings may not be as commonplace and well known to the general public as some of the newer, flashier lawyer rating badges plastered on virtually every lawyer’s website nowadays. There’s a simple explanation for that—earning the very highest Martindale-Hubbell rating of AV Preeminent is exceptionally difficult and actually signifies a genuine, major professional achievement. That’s definitely not the case for most of the newer badges seen on just about every lawyer website today. That’s why the AV Preeminent badge is relatively rare—it’s hard to get. 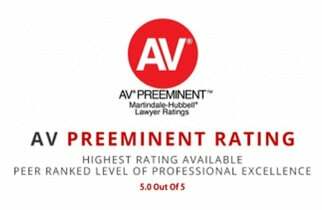 The relatively few lawyers who’ve earned the prestigious AV Preeminent rating, like Chris, are “at the very highest level of professional excellence” according to their fellow lawyers. Additionally, Chris has maintained his AV Preeminent rating for many years. Contact him by starting a live chat, calling now (561) 805-1214, or request a callback. In contrast to Martindale-Hubbell’s AV Preeminent rating, many of the other so-called lawyer ratings can be obtained with little more than a valid credit card or a couple of positive online reviews. Think about it, what does any rating or website badge truly signify if virtually every lawyer has it on his or her webpage? It’s basically the equivalent of a participation trophy—anyone who wants one, gets one. That’s definitely not the case with the AV Preeminent badge, which is the equivalent of the First-Place trophy in the world of lawyer ratings. Certification and rating services were originally introduced long ago as a way of distinguishing lawyers of the absolute highest professional caliber and ethical standards from the rest of the pack. Martindale-Hubbell lawyer ratings were introduced in 1887. The requirements to earn a top rating by a bona fide rating service like Martindale-Hubbell are rigorous, demanding a showing of subject matter expertise, years of experience, highest ethical standards, and the esteem of peers. That’s most certainly not the case for many of the newer rating services. Unfortunately, many of the newer services aren’t for the benefit of potential clients by making it easier to identify genuinely accomplished lawyers. Instead, they’re for the benefit of lawyers themselves in a desperately oversaturated market. Since lawyers must find ways to distinguish themselves in an increasingly competitive marketplace, legal certification and rating services have become the marketing tool for that purpose. And that’s all many of them are, but the general public has no easy way to distinguish which are simply marketing tools from those that signify genuine professional accomplishments. The proliferation of these newer services has only served to confuse the public, not educate. Many of them are little more than pay-to-play directories. For many of these types of services, the most challenging criterion in order to get listed is the willingness to write a check. Once paid, lawyers can use a service’s prestigious-looking logo and impressive sounding, yet virtually meaningless, designated title and badge on their website. Do you really know how these services hand out their impressive sounding ratings containing terms such as “Elite” or “Top” and flashy website badges? Are they the result of years of experience, peer acknowledgment of truly being among the very best lawyers, and a rigorous investigative process? The answer is almost universally “NO.” On the other hand, that’s exactly how a lawyer earns a top Martindale-Hubbell rating. Best Lawyers’ methodology is based completely on peer reviews. It’s designed to capture “the consensus opinion of leading lawyers about the professional abilities of their colleagues within the same geographical area and legal practice area.” To learn more about the rigorous screening and selection process, read about its methodology. Chris is consistently recognized by his peers as being at the pinnacle of the profession and thus earns inclusion in Best Lawyers each year. Online customer and client reviews are increasingly driving consumer behavior. In a recent influential study, researchers discovered that 67.7% of consumers are influenced by online reviews. That’s fine for choosing a restaurant or a landscaper. Customers are undoubtedly qualified to pass judgment on their skill and quality. You don’t need to be a professional chef or gardener to know whether they’re good at what they do. In stark contrast, that’s definitely not true when it comes to evaluating medical malpractice lawyers. Clients are indeed qualified to assess a lawyer’s proverbial bedside manner, which, of course, is an important consideration when choosing a lawyer. But honestly, a lawyer’s bedside manner and demeanor are not going to win your case. There are numerous variables that can dictate the outcome of any single case that doesn’t necessarily have anything to do with the legal abilities of the lawyer. It’s possible for a subpar lawyer to have a few good results and receive positive online client reviews from those cases. But it still wouldn’t be accurate to conclude that he or she is a really good lawyer. As the saying goes, even a broken clock is right twice a day. Online client reviews of medical malpractice lawyers can be useful sources of information for potential clients. They can provide a sense of how responsive and professional a lawyer seems to be towards clients. But they offer very little useful information about a lawyer’s true legal abilities and effectiveness. Online reviews are fine for buying a toaster on Amazon, not the hiring of a medical malpractice lawyer who you’ve entrusted with your financial and even personal wellbeing. It’s important to be aware of the limitations of online client reviews and not base the hiring of a lawyer solely on them. Chris has been helping medical malpractice victims like you for nearly 40 years. He helps victims and their families with no upfront costs and no charge for his services unless he wins your case or recovers a settlement. If you don’t need a lawyer, he’ll tell you. If he can help, he’ll personally get started on your claim immediately. Contact Chris today. Time is not on your side. Each day you delay in seeking legal help is one day closer to you being time-barred from ever bringing a claim for your injuries. Contact Chris by starting a live chat, calling now (561) 805-1214, or request a callback.